Marine conservation areas play an important part in conserving our marine ecology and protecting biodiversity. 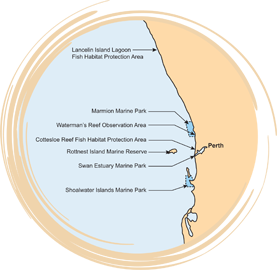 These areas include marine nature reserves, marine parks and fish habitat protection areas, so some restrictions may apply to the collection of marine life. Further information on Fish Habitat Protection Areas and related Fisheries Management Papers can be viewed at the Department of Primary Industries and Regional Development – Fisheries Division website.